“Southern Cross” is a 4-bedroom Inlet Beach home perfectly located on the south side of 30A, next to Rosemary Beach and just steps to the white sand and emerald waters of the Gulf. The three-story house offers luxury for your getaway with plenty of space to sleep and entertain 12 comfortably. The first floor is open concept with a gorgeous modern kitchen, dining area with seating for nine, and family room. The kitchen has white Carrera marble and stainless steel appliances and an island – a space that is perfect for relaxing while having appetizers and a refreshing drink. The first floor family room has a flat screen TV that has AppleTV for easy streaming of movies and music right from your own device! A master suite located on the first floor has a comfort King bed, flat screen TV, walk in closet and a beautiful en-suite bathroom. On the second floor you will find another master bedroom, a bunk room and laundry room with full-sized machines. 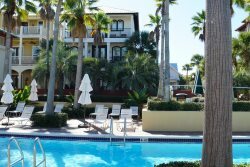 The master suite with a comfort King bed, flat screen TV, walk in closet, private balcony that overlooks the community pool with views of the Gulf and an independent audio zone. The spa-like master bathroom boasts a soaking tub, double vanities and separate shower that is truly amazing. The second floor bunkroom is equipped with two extra-long bunk beds, its own beautiful bathroom and even has USB phone chargers built right into the bedside outlets for charging devices! Situated on the third floor is another large family room with a wet bar, drink fridge, flat screen TV with AppleTV and a classic 80’s arcade game featuring 60 of your favorite games! Off the family room you will find an amazing Gulf-facing third floor outdoor deck, including a stainless steel gas grill, dual ceiling fans, a table that seats 8, and an independent audio zone controllable from your smartphone – the perfect place for sunset happy hour or dinner al fresco. Also on the third floor is the fourth bedroom that has a comfort King bed and extra-long twin bunks for families that don’t want to be split up. This bedroom has its’ own bathroom that has a private water closet and double vanities. Southern Cross also has an outdoor shower for easy clean up after a day at the beach, a community pool and is a short walk or bike ride to Rosemary Beach, Shades, the Shops at 30Avenue and the iconic Donut Hole.